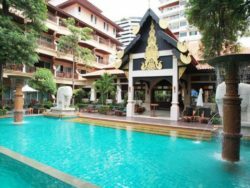 Jomtien Beach has fewer guest friendly hotels than Pattaya, but it’s still an excellent place to stay if you prefer a quieter, more laid back atmosphere. Luckily, there’s still a good selection of guest friendly hotels in the Jomtien Beach area. We’ve listed all of them below, along with the average review score for each hotel and links to check prices and book directly on Agoda.com. 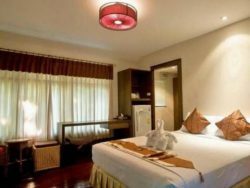 Centara Grand Phratamnak Pattaya * Five to 10 minutes to Jomtien Beach One of the most luxurious hotels around Jomtien Beach, Centara Grand Phratamnak Pattaya is a good choice for a romantic weekend. 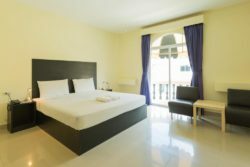 This budget hotel in Somprasong Plaza is located less than a minute from the beach and close to many of Jomtien’s best restaurants and bars. The rooms are simple but more than comfortable enough for a night’s stay, and there’s no charge for bringing back a guest overnight. Recommended if you’re looking for somewhere cheap and simple. Rated 7.6 out of 10 by Agoda users. 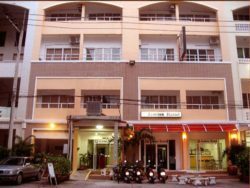 Located between Jomtien Soi 11 and 12, Jomtien Morningstar Guesthouse is a short walk away from Jomtien Beach. From the hotel, there are plenty of restaurants and chilled out local bars within a couple of minutes’ walk. Rooms here are clean and simple, with everything you need for a comfortable stay at a fair price. 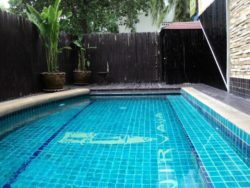 As you’d expect from a 2 1/2 star guesthouse, Jomtien Morningstar Guesthouse doesn’t have a pool or other facilities. However, it offers great value for money and is an excellent choice if you just need a comfortable, clean and guest friendly room to stay in on a budget. Rated 8.2 out of 10 by Agoda users. 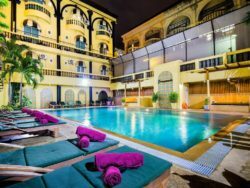 This three star hotel massively overdelivers in terms of quality, with rooms and facilities that look like they came from a high-end four star hotel. 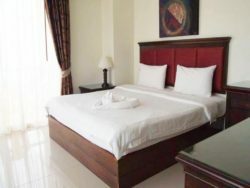 Rooms here are spacious and nicely furnished with huge beds, as well as LCD TVs, living room furniture and work desks. 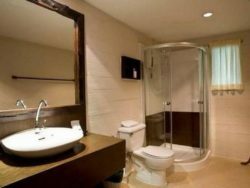 The bathrooms are nice and modern. Zing Resort and Spa is located inside Jomtien Complex, meaning you’ll be right in the middle of one of Pattaya’s gay nightlife areas. It’s also a short walk from Dong Tarn Beach and Jomtien Beach. A good choice for gay visitors, although straight guests won’t feel out of place at all. Rated 8.0 out of 10 by Agoda users. Located just off Jomtien Soi 1, Eurostar International Hotel is ideally located close to restaurants, bars and entertainment. Rooms here are simple but comfortable enough and provide decent value for money. However, the hotel is starting to show some signs of age and could do with a makeover. There’s an outdoor pool that’s good for sunbathing beside but feels a little over-chlorinated. 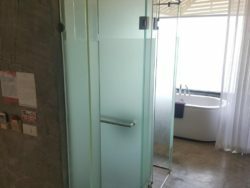 Some guests have also complained about the service here, although we’ve never noticed anything other than friendly service, as is usual for Pattaya. On the whole, a decent option but nothing special. 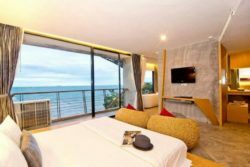 5ive Beach House Hotel is located right on Jomtien Beach, giving you great views of the sea. This is a modern three star hotel with nice rooms, some of which provide direct ocean views. 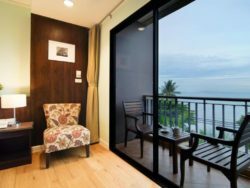 Pricing is on the affordable side, especially compared to the beachfront hotels on Pattaya Beach Road, and the quality of the hotel is good. Facilities here are fairly minimal, although some rooms have outdoor hot tubs which are great for relaxing with guests and enjoying the view. It’s best to pick a room with a sea view if you stay here, since they’re by far the nicest and offer the best overall experience. Rated 7.3 out of 10 by Agoda users. 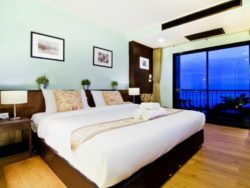 Another beachside hotel, The Jomtien Twelve has spacious rooms that overlook the Gulf of Thailand. This hotel is quiet, clean and comfortable but, being built in the late 90s to early 2000s, is starting to show its age a little bit. In terms of location, however, this hotel is tough to beat. It’s less than a minute from the hotel to the beach, and there are several good bars and restaurants in the surrounding area. The breakfast is good, the rates are fair and the view from the rooms is excellent, making it worth considering if you don’t mind slightly dated rooms. Rated 7.0 out of 10 by Agoda users. Inrawadee Resort is a small resort located about 700 meters from Jomtien Beach, meaning you can get to the beachfront in 5-10 minutes using the baht bus. It’s also possible to walk to the beach, although it can take quite a bit of time. Rooms here are a little dated and the hotel itself feels like it could use some renovations, although the low prices mean it’s still good value for money. A decent place to stay if you want resort-style facilities (like an outdoor pool and garden setting) and don’t mind a slightly older design and decorating style. Rated 6.6 out of 10 by Agoda users. 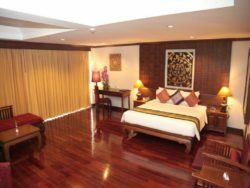 A great little three-and-a-half star hotel, The Now Hotel is one of the best guest friendly options in Jomtien. Rooms here are stylish, comfortable, modern and beautifully decorated, with some rooms offering panoramic views of the beach and sea from the windows. Definitely one of the best mid-priced options in Jomtien. It’s also 100% guest friendly, with no joiner fees for overnight guests. From the hotel, it’s a two minute walk to the beach and even less time to nearby Thai and Western dining options. A good choice if you want an enjoyable stay in Jomtien on a moderate budget. Rated 7.8 out of 10 by Agoda users. Another option close to Jomtien Beach, New Eurostar Hotel and Spa is less than two minutes from the sand, sea and sun. Rooms are spacious and clean, although somewhat dated in terms of style and decorating. Many rooms have great views over the sea, making this a relaxing place to stay. Facilities include an outdoor pool with great views of Jomtien Beach, as well as a Thai and international restaurant. Overall, a good place to stay if you want to be close to Jomtien Beach. 100% guest friendly, with no joiner fees. Rated 7.6 out of 10 by Agoda users. 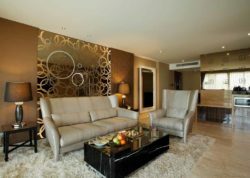 One of the best hotels on Jomtien Beach, Fifth Jomtien is modern, clean, luxurious and ideally located. 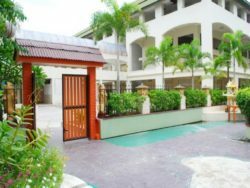 This hotel is less than three minutes from the beach on Jomtien Soi 5, making it easy to walk between the hotel and the beach. It’s also a short walk to local bars, restaurants and cafes, giving you plenty of eating and entertainment options around the hotel. 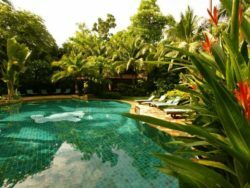 The hotel itself has a great outdoor pool that’s perfect for relaxing beside, plus lush garden grounds that make it a very peaceful space. 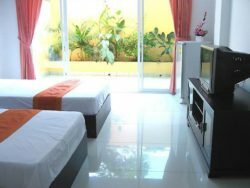 Rooms here are large and affordable, much more so than in Pattaya. 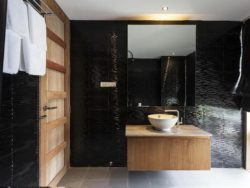 The smallest rooms still offer more than 38 square meters of space, while some of the larger suites offer as much as 76 square meters of living space, complete with super modern bathrooms and kitchen areas. 100% guest friendly and recommended if you want somewhere upmarket, quiet and affordable. 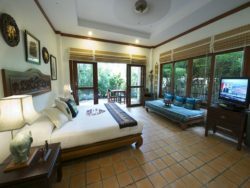 Another good mid-priced option, Nirvana Boutique Suites is a three star hotel on Jomtien So i4. 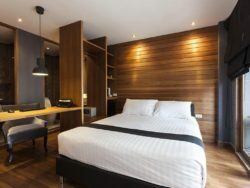 Rooms are modern, spacious and well maintained, although service can be a little on the cold side. 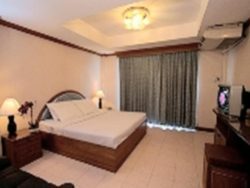 Nevertheless, nice facilities and a calm atmosphere make this a good guest friendly option in Jomtien. Rated 7.7 out of 10 by Agoda users. 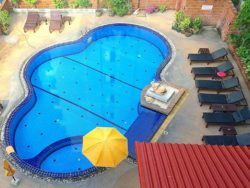 One of the best four star hotels in Jomtien, Avalon Beach Resort has a huge outdoor pool, several good dining options and spacious rooms that offer lots of comfort. Like many of the large resorts around Pattaya, this hotel was built in the 90s and has a slightly older feel to it. 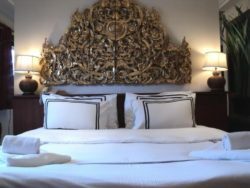 Despite this, the rooms are in great condition and — unlike many other hotels of its age — have clearly been well maintained and cared for over the years. Because this is an older hotel, the rooms are gigantic, with lots of space and large balconies overlooking the beach. 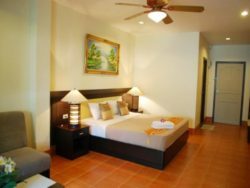 The facilities are also excellent, making this a good value for money option if you want a four star experience in Jomtien. Rated 8.2 out of 10 by Agoda users. 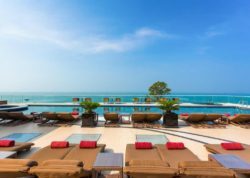 One of the best luxury hotels on Jomtien Beach, the Centara Grand Phratamnak Pattaya sits between Pattaya and Jomtien, with a location close to Phra Tamnak hill. The hotel itself is a luxurious five star affair with spacious, modern rooms and a nice rooftop swimming pool overlooking the ocean. There’s also a small but well equipped fitness room, two restaurants and everything else you’d expect from a high-end luxury hotel. 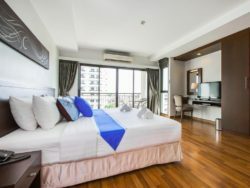 From a location perspective, this hotel is a little far away from the action, meaning you’ll need to use the hotel shuttle to get to and from Jomtien or taxis to get into Pattaya. However, if you’re looking for a quiet, romantic place to spend your time with new friends, this hotel definitely fits the bill. It’s 100% guest friendly, with no extra fees for joiners. Rated 7.9 out of 10 by Agoda users. By far the best four star resort on Jomtien Beach, Rabbit Resort has a great location right next to the water. This resort is on Dong Tarn Beach (the Pattaya area’s gay beach, although it’s visited by all types of people), which is worth noting if you’re uncomfortable with this kind of environment. Rooms at Rabbit Resort range from spacious, comfortable luxury cottages to a variety of pool access rooms. The facilities here are great, with a garden setting and big outdoor swimming pool. 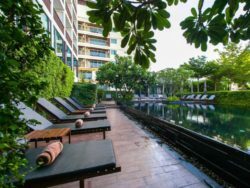 Overall, a great place to stay, especially if you want to be a short taxi ride away from Pattaya but far enough away to avoid the hustle and bustle of the city. As always, 100% guest friendly with no joiner fees. Rated 8.8 out of 10 by Agoda users.